Mark Hamill and James Gunn have teased the possibility of a 'Guardians of the Galaxy Vol.3' collaboration. The 'Star Wars' legend and the filmmaker behind the superhero blockbuster have hinted in the past that the actor could join the Marvel Cinematic Universe, and now they've added to the speculation. Sharing the snap on social media, Gunn wrote on Instagram: "Finally stopped by my neighbor @hamillhimself's for that cup of coffee we talked about on twitter months ago. And some bbq. And cornbread. And cobbler. "And OKAY IT'S TRUE I ATE THE HAMILL'S OUT OF HOUSE AND HOME BACK OFF. Honestly, though he's an amazing guy and I am really grateful to him and the whole Hamill clan for a great Sunday." Hamill posted the picture himself and suggested that the topic of the MCU may have come up in conversation, as he revealed they spoke about "EVERYTHING". In his coy caption, he wrote "Such a great day meeting my neighbor @JamesGunn! We have so much in common & talked about EVERYTHING: the weather, gardening tips, favorite recipes, growing up Catholic, our mutual love of dogs, bleu cheese, risqué limericks & the weather again. #FunWithGunn." 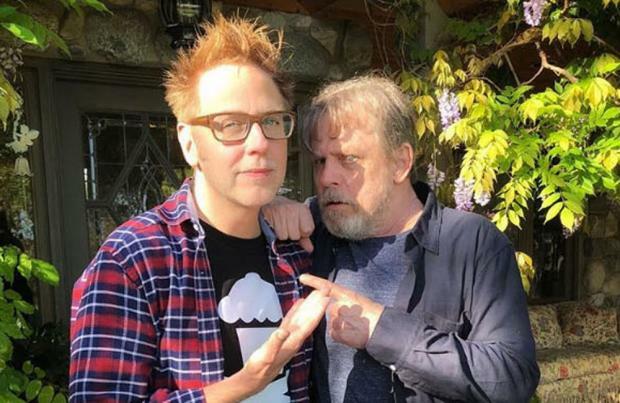 Hamill is best known for starring as Jedi Master Luke Skywalker in the hit sci-fi franchise 'Star Wars', but in a Twitter conversation with Gunn in February appeared to get the ball rolling. A Twitter user wrote: "@JamesGunn, could you do me a huge favour and find a role for @HamillHimself in Guardians 3? The awesomeness of it might end me, but I'm willing to risk it. Thanks (sic)"
Gunn replied saying the star can "come over" to his house in Malibu to talk about a role. He replied: "I think @HamillHimself lives around the corner from me in Malibu so he can just come over and we can talk about it over a cup of coffee. [sic]. And Hamill - whose character died in the eighth instalment of the franchise - joked he was happy to meet with the filmmaker as he is now an "unemployed actor". He wrote: "I would be happy to do so, both as a good neighbor & an unemployed actor. All the best, mh ... DM me for my contact info if you're serious. (& a good neighbor) xoxo, mh [sic]"